April 9, 2019, 6:56 PM · I’ve had my share of squeaky tones. The whistling open E string has made me more than once consider giving up the violin. There was one benefit to the bone-chilling, music-killing screech of the E string. It pointed out that I didn’t understand the relationship between the hair and the string. When it’s done properly, the sound that sings from the violin is as spontaneous and reliable as playing a piano key or turning on a light switch. The moment when the string is fully vibrating is called the engagement. It relies on two essential elements, rhythm and patience. When the hammer hits the piano string, there are several forces at play that apply to the violin. The string is always struck squarely, without any hesitancy. The hammer is even designed to have natural momentum at the point of impact, something percussionists have to employ with great skill and no mechanical aid. The hammer’s felt tip strikes the string and creates an action which makes the string vibrate perfectly on impact. Even if the felt is hard, dry, and worn out, the string will vibrate and ring. What do I have to do to replicate that same vibration on the violin? I’d like to describe the actual beginning of the stroke, without regard to what happens with the rest of the movement, because I believe that the technique of engagement is unique and should be consciously, or unconsciously, understood. What I call the “thud” is the sound of bow hair entering the string uninvited. It may resemble a whistle, scratch, screech, or scrape, but never a vibrating string. What happens in that split-second when the hair touches the string, just before the detaché movement takes place, will depend on my appreciation of the moment. Will I wait for the vibration to activate, or will I ignore it and plow ahead? What should happen next is that the hair engages the string after being touched gently but resolutely. The string opens up during this exquisite moment, emerging from a static state into a fully vibrating object. This is such a natural process that it is not necessary to find the exact words to define it. Far more important is to describe it in images, so that the violinist can discover what engagement feels like through experimentation. Here is where talent, both technical and musical, comes into play. We look within ourselves to make sense of the rote knowledge we are given to work with. Talent helps us understand the relationship between two components which shouldn’t work together but actually do. For instance, listening to our inner, sensible voice helps us transform a black, fretless, length of wood, into well-fined sections of half-steps and whole-steps. We even factor in the variations and complications due to the various planes. Without such visualization, pitches and distances would be random. Every time the string stops, it needs to be re-engaged. Examples include every change of bow direction, change of string, all staccato notes, spiccato notes, and tremolos. Particularly frustrating is preparing mentally for engagement of new string thicknesses. The mind tends to remember the last string it was on, rather than be ready for the next string. While this can be annoying, it is incredibly gratifying to feel the thicker string open up in a brief moment. I have tried to describe to myself the phenomenon of the hair taking all of the lower strings into its seemingly flat territory. To make it even more interesting, the string is moving 360 degrees, all the while circulating in a healthy, robust environment. This is indeed an act of sublime invention. I would have loved to know Einstein’s thoughts, a violinist who attributed some of his insights on relativity to music, and more specifically, to the violin. It helps me to imagine the hair is “around” the string, rather than “into” the string. What can we learn from highly gifted violinists who unconsciously understand how the hair and string engages? Talent teaches us to patiently understand reality. For example, it takes a moment for the string to blossom. Also, the detaché that follows should not be rushed, and should “coast” through the vibrating motion. Talent teaches us to pay attention to the technique needed at the moment. Looking for shortcuts, such as complex ways of holding the bow or changing direction, merely diverts the necessary concentration. When I view the bow arm as a conveyor belt, I see something that doesn’t have a lot of intricate parts that can break down, or that must move in a particular way. Instead, the pure, uncomplicated bow arm allows me the luxury of concentrating on unleashing the string’s full vibrations. 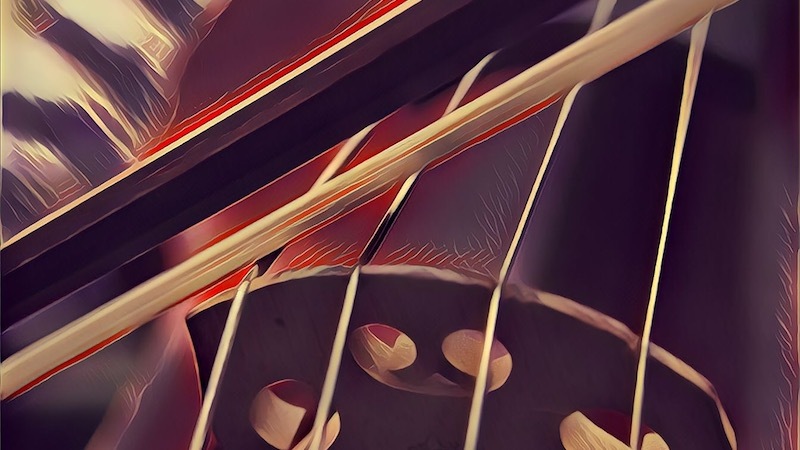 April 11, 2019 at 02:16 PM · I wish a slo-mo video of a violin or cello being played had been included.